According to Barclays PLC, the plunge in goldprices has forced world’s top producers to cut fresh mine investments by nearly half. 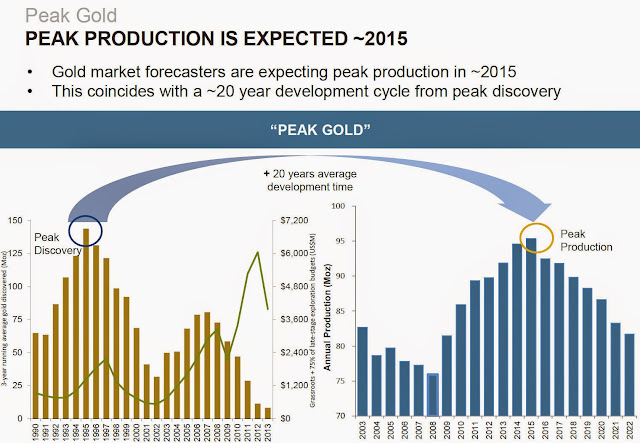 This could result in nearly 1% decline in gold mine production during 2016. The contraction in mine supply may tighten the physical market,noted Barclays. The gold mine supply during 2014 had totaled 3,114 metric tons. The bullion output may probably rise during 2015 as well, but the increase in production will be the smallest in six years. AngloGold Ashanti Ltd has already announced plans to cut its gold output by 10% in 2015. The mining activity at high cost mines would be halted, they said. As per metals focus data, the low gold prices have turned nearly 10% of global mine operations unprofitable. Incidentally, Barrick Gold Corp reported net loss of $2.9 billion in 2014, mainly on account of sharp plunge in gold prices and writedowns of Chilean and Zambian mines. According to data, capital spending by 11 major gold producers has dropped by almost 50% since 2012. Ten of the world’s largest gold producers reported a combined loss of $6.9 billion in 2014, as compared with a combined profit of $11.3 billion posted in 2010. Gold prices have dropped almost 37% from the all-time highs during 2011. Experts rule out probability of a gold rally, especially on account of easing inflation and strengthening U.S. currency. Gold-backed funds have witnessed a net outflow of nearly 800 tons during the past two years. Analysts predict sharp decline in gold output effective 2017 onwards. The drop in mine production is likely to further influence gold investors' sentiments..
Yellowknife, Northwest Territories - TerraX Minerals Inc. (TSX.V: TXR; OTC Pink: TRXXF; Frankfurt: TX0) has agreed to grant an option to Osisko Exploration James Bay Inc. (formerly Virginia Mines Inc.) ("Osisko Exploration"), a wholly-owned subsidiary of Osisko Gold Royalties Ltd. ("Osisko") (TSX: OR) to purchase an additional 1.0% net smelter return royalty ("NSR") on its wholly-owned Yellowknife City Gold Project ("YCG") in the Northwest Territories. To purchase this option, Osisko Exploration will pay TerraX $1 Million in cash. The option entitles Osisko Exploration to purchase a 1.0% NSR on production from the properties that comprise the YCG by payment of an additional $2 Million within 3 months following commencement of production. This 1.0% NSR is in addition to the existing Osisko Exploration option to acquire a 2% NSR on YCG (subject to underlying royalties to certain property vendors, and payment of $2 Million within 3 months of the start of production from those properties). 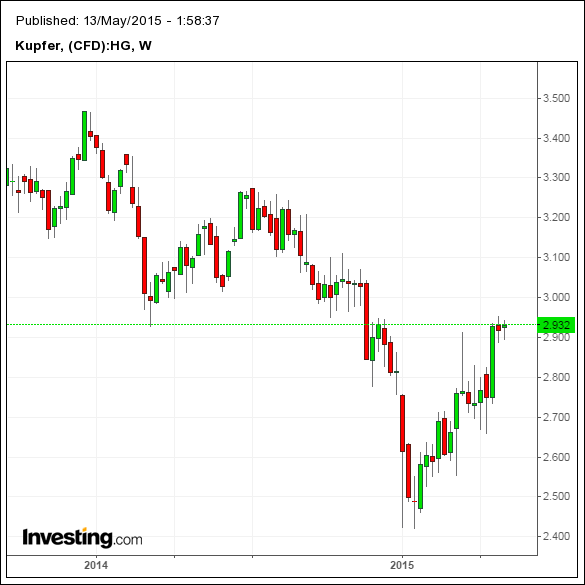 Osisko Exploration owns 9.24% of the common shares of TerraX..
Am Kupfer-Terminmarkt wird wieder enorm gezockt, ganz vorne dabei sind erneut die Chinesen..
One of the Chinese funds reckoned to be behind a precipitous fall in the price of copper at the start of the year has not followed its peers and closed its bearish bets on the industrial metal. Chaos Ternary Futures, a unit of Shanghai Chaos, remains the biggest holder of short contracts on the Shanghai Futures Exchange, with 24,679 contracts, equivalent to 123,395 tonnes of the red metal, up from 9,996 contracts at the beginning of the year. Short contracts are bets that the price will fall.